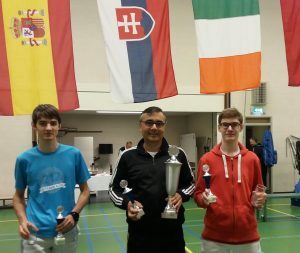 De AEW Epee Team was victorious at the ‘Alec Jongejans memorial’ tournament in The Hague this weekend. The trophy was contested by a total of 12 teams. The AEW team consisted of juniors Samo Rudi, Thomas Lugtenburg en our maître Edwin Treffers. The maître was complimented on the quality of fencing of the juniors. The ladies’ Team consisted of Ingeborg Hooijkaas, Simone Philipsen, en Sonja Leyvraz. They had an enormous amount of fun at the tournament. Not least because of the tournament format required all 12 teams to fence all the other teams. AEW made one fencer in their team available to join the team of the organising fencing club, the Military Fencing Club MVO. Nikolai Mogensen’s help was greatly appreciated.